Ketsugo Goju-Ryu is a comprehensive training system rooted in self-defense. There isn't a set schedule of material for each day of the week, the curriculum changes daily so your body doesn't get used to a pattern. Everything starts with basics or kihon. You have to learn footwork, punching, blocking, kicking and basic stances. From there you learn kata, two-person drills, and other things described below. There's certainly no shortage of material, but everything you learn must be practiced over and over. We spend a great deal of time with each student to make sure the moves are done correctly, to the right targets, with the right spirit, etc. We work self-defense as realistically as possible while still in a controlled environment. It's a learning process that isn't accomplished over night and takes a great deal of patience. But if you're open to learning it's an incredibly rewarding training experience. Kata are sequences of offensive, defensive and transitional movements that are linked together to illustrate specific self-defense techniques and sometimes hidden moves. Karate skills have to be learned, practiced and conditioned to the point of automatic response. In Ketsugo Goju-Ryu we employ many routines and training methods to help condition the student's body, mind and spirit. Bunkai is the application of technique. In Kata Kumite, two students perform pre-determined sequences to bridge the middle area between kata and actual fighting. They allow the student to apply and understand the fighting techniques of the kata against an opponent. In Kiso Kumite, students train with a partner and focus on pre-arranged counter techniques. The counters include many of the kata bunkai techniques such as strikes, throws, take-downs, and joint manipulation. 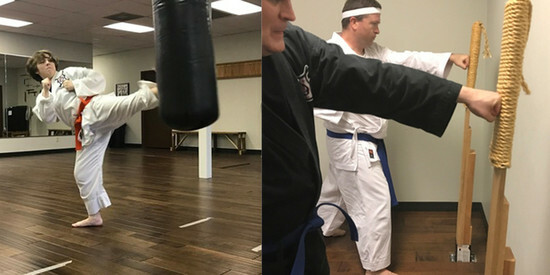 The Bunkai punching routine involves students paired up, going through moving punching and blocking techniques; emphasizing strength, timing, distance and precision. Waza (or techniques) are one-step fighting techniques which focus on control, distance, timing and targeting. Over time, as the student progresses in rank and skill these waza become more technical. Realism is always central to the technique. Self-defense is at the heart of everything we do in Ketsugo Goju-Ryu. Every aspect of training is centered and rooted in self-defense, from kata to sparring. The training provides the student with the speed, strength, timing, and distance needed to react appropriately to any given self-defense situation. Specific self-defense training involves evading and countering holds, grabs, and joint locks; and for each rank, there are new self-defense techniques to learn. Self-defense against the knife, gun, and club are also part of our training. After the first belt test students begin sparring. Sparring is a great way to implement various techniques as well as improve hand eye coordination, timing, distance, techniques, and confidence. Safety is important to us here at Oliver Karate Academy and we take the welfare of our students very seriously. No one may spar without a black belt being present and watching. Lower belt ranks (orange and below) set the pace of the sparring match so they can develop their techniques gradually, and contact is always age, size and rank appropriate. At green belt, students begin using sweeps and take-downs. Protective gear is worn on hands, feet, head, shins, and groin. We practice both unarmed (karate) and armed combat (kobudo). We train with traditional weapons including the bo, tonfa, sai, nunchaku and kama. The weapon becomes an extension of the body and is treated very seriously. Weapons are typically reserved for higher levels of training, but are part of the system as a whole. 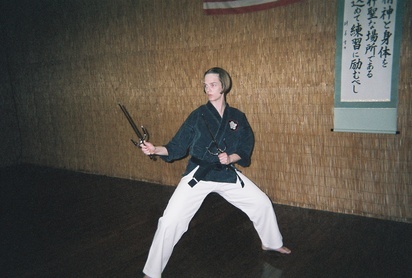 We do not separate weapons (kobudo) from the overall curriculum.